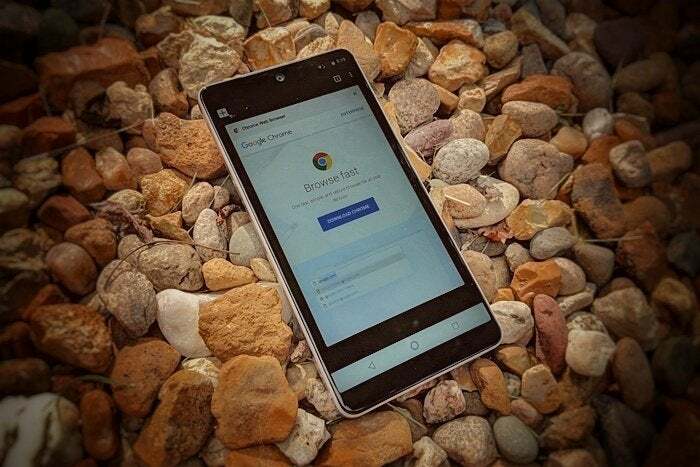 Become a mobile browsing pro with these advanced tips for Google's Chrome Android browser. Mobile web browsing is all about finding what you need quickly and with as little hassle as possible — well, in theory, anyway. In the real world, the act of surfing sites from your smartphone is often anything but efficient. From sites that have not-so-friendly mobile interfaces to browser commands that take far too many steps to execute, hopping around the World Wide Internuts from a handheld device can frequently leave something to be desired. Fear not, though, my fellow finger-tappers: There are plenty of tricks you can learn to make your mobile web journey more pleasant and productive. 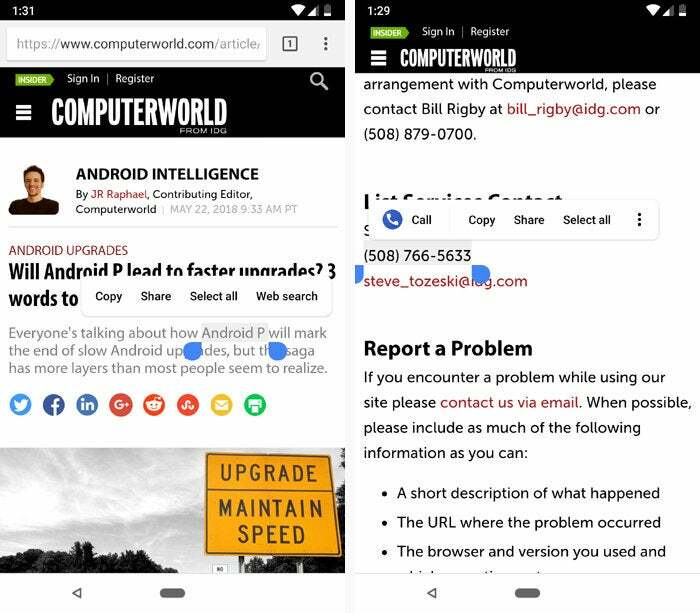 Try these next-level tips for Google's Chrome Android browser and get ready for a much better mobile browsing experience. Got multiple tabs open? Move between 'em with minimal effort by sliding your finger horizontally across the address bar. You'll be zapping between sites in seconds. For more advanced tab management, swipe down on a tab, starting at the address bar. That'll take you to Chrome's tab overview interface, where you can see all of your open tabs as cards. From there, simply tap on any tab to jump to it, or swipe sideways on it to close it. Chrome's tab overview interface is the fastest way to view and manage tabs. When you have tons of tabs open and want to clean house quickly, tap the three-dot menu icon within that same tab overview interface — and whaddya know? There's a handy hidden command there for closing all of your tabs in one fell swoop. Sure, you can copy a site's address by opening the main Chrome menu, selecting "Share," and then selecting "Copy to clipboard" from the list that appears — but sweet sassy molassey, that sure seems like a lot of steps. Snag a URL with less work by pressing and holding your finger to the address bar — right where the URL is — and then hitting "Copy" from the menu that pops up. The next time you're about to head onto a flight, into a tunnel, or into a time machine that's transporting you back to an era without Wi-Fi, plan ahead and save some articles for your offline reading enjoyment. 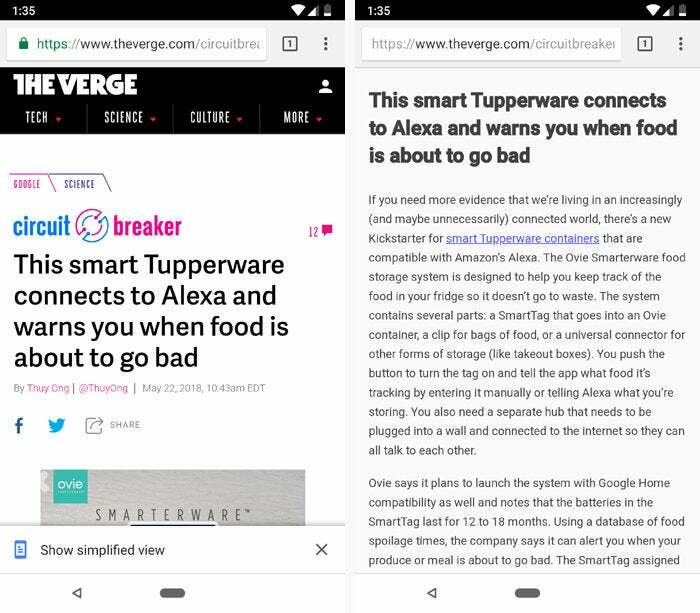 You'd probably never know it, but Chrome actually makes that easy to do: While viewing any web page, open the main Chrome menu — by pressing the three-dot icon in the app's upper-right corner — and tap the downward-facing arrow icon at the top. And that's it: Chrome will save the entire page offline for you. Whenever you want to find it, just open up that same menu and select "Downloads." Chrome's "Downloads" section lets you store and view complete web pages for offline viewing. All of your saved pages will be there and waiting, regardless of what place, year, or dimension you happen to be visiting. Maybe you want to make a more permanent and easily shareable offline copy of a web page. Hey, no problem: Just save it as a PDF. Open Chrome's main menu while viewing the page, then select "Share" followed by "Print." Make sure the printer is set to "Save as PDF" — if you see some other printer name at the top of the screen, tap it to change it — and then tap the circular blue icon in the screen's upper-right corner and hit the "Save" button on the next screen. 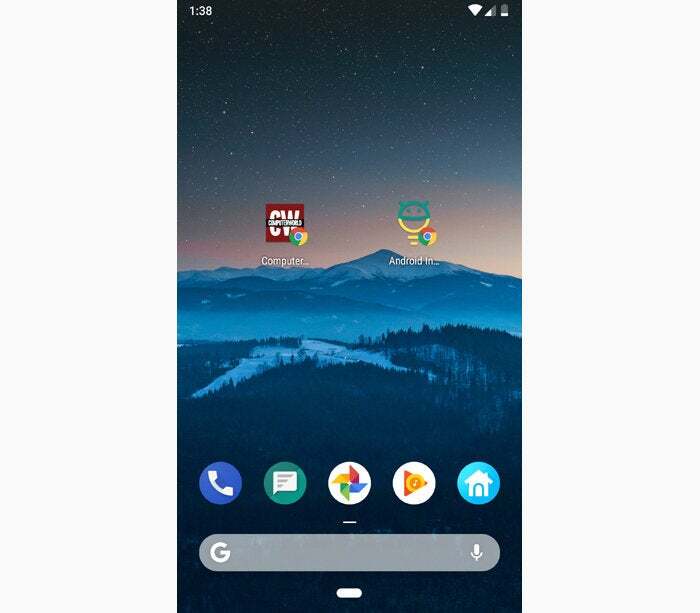 All you have to do next is open your phone's Downloads app or your favorite Android file manager to find the document. Why waste energy typing things into Chrome when you can just tap to find what you need? Anytime you see text on a web page that you want to act on, press and hold your finger on the words — then use the sliders that appear to adjust what's selected. 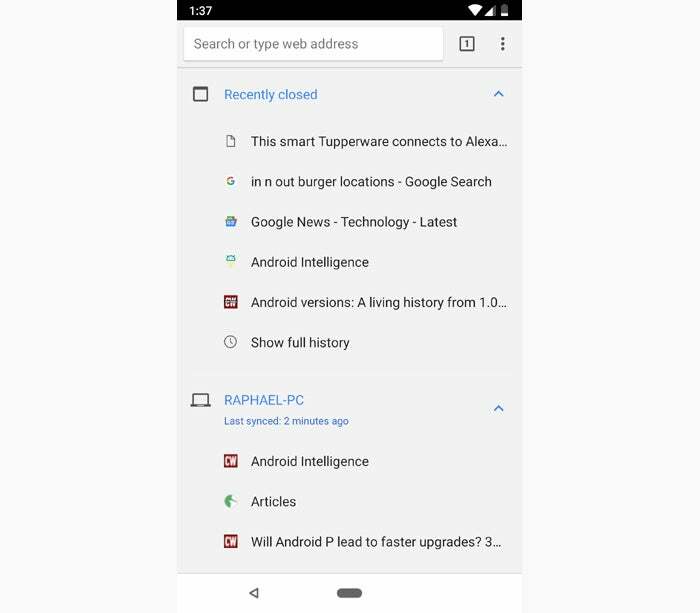 Chrome will pop up a small menu with options to perform a web search on the phrase or to share it to any other app on your device (like a messaging service or note-taking app, for instance). If you're using Android 8.0 or higher, the system should also automatically recognize and offer appropriate one-touch suggestions for things like phone numbers, physical addresses, and email addresses. Tap some text to share it, search for it, or act on it in other context-appropriate ways. Chrome has a hidden way to scan a page for a particular term without much effort: Open the browser's main menu, select "Find in page," and type in the term you want. Hit the down arrow at the top of screen once — and then, instead of hitting that same arrow over and over to see every place the term appears, slide your finger down the vertical bar at the right side of the screen. That'll move you rapidly through the page, with every instance of your term highlighted for hassle-free viewing. Pinch-to-zoom is, like, so 2013. When you're using your phone with a single hand, as so many of us tend to do these days, Chrome has two far easier methods of magnifying a specific part of your screen. First, on many devices, you can simply double-tap anywhere on a page to zoom into that area and have it take up the full width of your display. Double-tapping a second time will then zoom back out. Second — and especially nifty — you can double-tap and leave your finger down, then drag downward to zoom in or upward to zoom out. It sounds a bit strange, but give it a try; it'll get you where you need to go without all the awkward finger yoga that comes with one-handed pinching. For some inexplicable reason, lots of websites prevent you from zooming in on your mobile device in any manner. And for a variety of reasons — whether you want to make the text larger or get a closer look at something that catches your eye — there are bound to be times when you want to move up close and personal. Thankfully, Chrome lets you take back control. Head into the app's settings, open the Accessibility section, and find the option labeled "Force enable zoom." Activate the checkbox alongside it and get ready to zoom to your heart's content — whether the website you're looking at wants you to or not. Google has a solution: Chrome's simplified view mode, which makes any website a bit more mobile-friendly by simplifying the formatting and stripping out extraneous elements such as ads, navigation bars, and boxes with related content. Look in that aforementioned Accessibility section of Chrome's settings and make sure the box next to "Simplified view" is activated. Then, whenever you're opening an article, watch for a white bar at the bottom of your browser with the words "Show simplified view." Tap it — and the text will transform right in front of your tired eyes. Before and after: Chrome's simplified view. Need easier reading yet? Go back to that Accessibility section of Chrome's settings and play with the "Text scaling" slider at the top of the page. It'll make all the text you encounter across the web larger, independent of your system-level text size setting. Need to reload a page? Swipe downward from anywhere in the main browser area. (You'll need to be scrolled all the way to the top of the page in order for it to work.) Once you see a circle with an arrow appear, you can let go, sit back, and say: "Ahh. Isn't that refreshing?" Excessive tapping is for amateurs. Instead of tapping Chrome's menu icon, lifting your finger, and then tapping the item you want (pshaw! ), slide downward on the button to move right into the menu without ever lifting your precious paw. Just keep swiping down until you reach your desired option, then let go — and Chrome will select it for you. 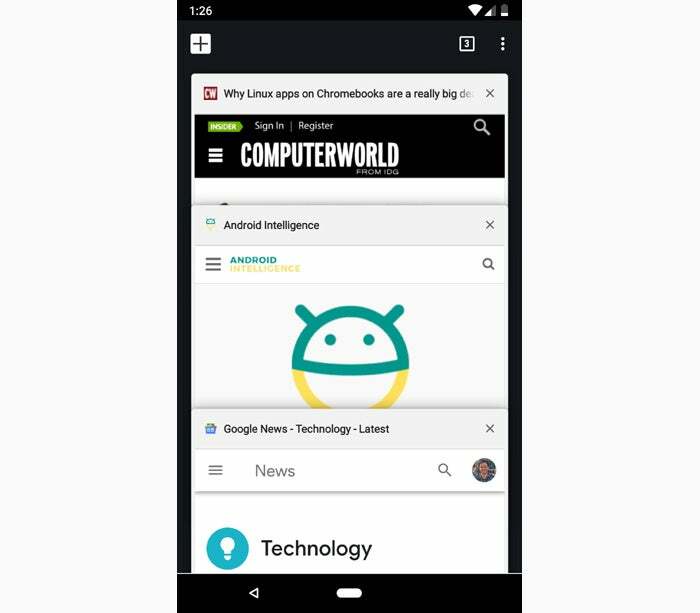 One of Chrome's most powerful features is something you might not even know exists: The browser always keeps all of your tabs synced and available across devices — which means you can open up Chrome on your Android device and get to the same tabs you left open on your laptop or desktop computer. All you've gotta do to take advantage of it is open up Chrome's main menu and select "Recent tabs." There, you'll find a full list of tabs currently or recently open in Chrome on any devices where you're signed in. Just tap the tab you want, or press and hold on a device's name to find an option to open all of its listed tabs at once. You might not know it from its name, but Chrome's "Recent tabs" section covers more than just your mobile device. Maybe it's not a recently open tab you need but one you had open a while ago — say, a page you were viewing from your laptop last night, before you shut it down and put on your favorite pink footie pajamas. Well, no problemo: Tiptoe your way back to Chrome's main menu, and this time, select the line labeled "History." Here's the secret about that section: It shows every page you've had opened in Chrome while signed in on any device — including desktop and laptop computers along with any other phones or tablets — all in a single searchable list. You can browse through the pages chronologically or look for specific keywords using the box at the top of the screen. For any site you visit routinely, make your life a little easier by placing a one-tap shortcut directly to it on your device's home screen. Just look in Chrome's menu for the "Add to home screen" option. That'll put the current site's icon right where you'll always see it for fast future access. Add sites to your home screen and then access them just like apps. These tips all revolve around the notion of saving time — so how about one that quite literally makes web pages load faster while also helping you use less data? Chrome's Data Saver mode is a powerful yet out-of-sight system for doing exactly that: When activated, the feature routes pages through Google's servers — in a split second — before they reach your device. The pages are then compressed and sent to you in a sized-down form, though you probably won't notice any difference from a visual perspective. The only catch is that the option won't work with secure HTTPS pages, so as more and more websites adopt HTTPS, Data Saver's impact is increasingly limited. But still, every little bit adds up. You can try it out by opening the Data Saver section of Chrome's settings. Once the feature's been running for a while, visiting that same section will show you a detailed breakdown of exactly how much data you've saved over time. 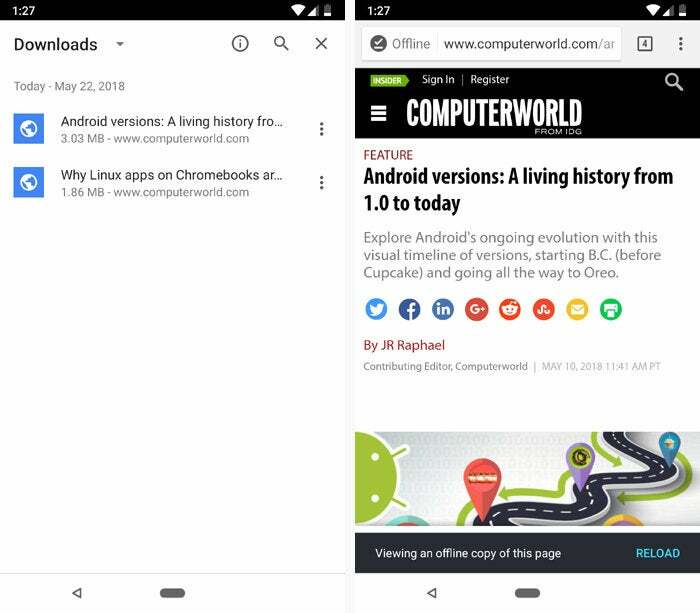 You may know that Chrome offers different release channels for its desktop browser — but did you know you can also opt to be more adventurous with Chrome on your Android device? If you like trying out new features before they're released, grab Google's Chrome Beta app. It gets new elements and interface changes before they're ready for prime time (which, fair warning, means they might occasionally be a bit unpolished). And if you're really feeling bold, give the Chrome Canary app a whirl. It's the most unstable and frequently updated channel of Chrome, with features so fresh they're bound to be partially uncooked on occasion. The best part? All of the Chrome Android channels exist as separate standalone apps. That means you can install any or all of them and run them right alongside the regular Chrome app, with no major commitment and no real risk involved. And that, my friends, is what we call livin' on the edge — in the most gentle and hazard-free way imaginable.